Elegant Engagements Wedding and Event Planners: Bowl full of Cherries! Hand dipped long stemmed cherries - a perfect gift for the holidays; for a friend or business associate. Also great idea for Valentines day, Easter or other special occasions. They come with white, milk or dark chocolate. 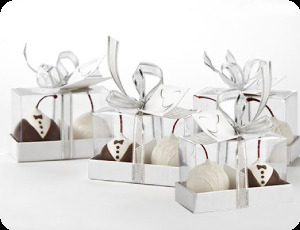 I love it as a wedding favor - look how cute the picture of the wedding dress and tux cherries are! 4 2 piece boxes (above) are $26.99. Or buy them in increments of 15 for $24.95 and make your own packaging. So cute! The fun of the apples without the price! Plus cherries are so hard to get in season - so this is perfect for someone who really loves them. Great find!